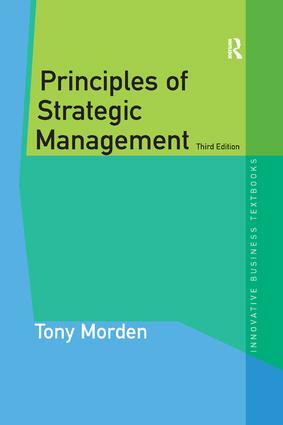 Now published in its Third Edition, Principles of Strategic Management by Tony Morden is a proven textbook that offers a comprehensive introduction to the study and practice of strategic management. This new edition covers the fundamentals of strategic analysis and planning, strategy formulation, strategic choice, and strategy implementation. It contains new material on leadership and corporate governance, and on the strategic management of time, risk, and performance. There is a new chapter on the key issue of crisis and business continuity management. The book retains the strong international flavour of its predecessors. The book is constructed in sharply focused Parts and Chapters. The text is then broken down into accessible Sections. The presentation is clear and reader-friendly. Principles of Strategic Management is ideal for use on undergraduate, conversion masters, and MBA courses in business and management. Its reader-friendly approach also makes it suitable for block-release type courses, distance-learning programmes, self-directed study, in-company training, and continuing personal professional development. Tony Morden is an author and lecturer in strategy and management He is the author of the Ashgate text Principles of Management, which is now available in Chinese language and Arabic editions.